It is fair to express concern on the empathy of those above for the rakyat. Quite sure the opposition including BN-turned opposition voices would use that to attack the government. Election is drawing near. Most of his comments have been heard before in one form or another. It is the part about Taman Tugu and Bukit Kiara that is of interest. Daim is known to be resourceful in securing information. He knows something others do not know yet. He tells he is sold stocks to makan rojak and market tumble. Does he know something we do not know happening with the Taman Tugu project? Heard one of the party mentioned as part of the group to develop do not know head or tail about it. But why would Khazanah be doing name throwing? Since Bukit Kiara is mentioned, there is land allocated for national park. Daim asked why it was not gazetted? It is fine for Khazanah to develop and do cross funding for Taman Tugu. But it is not fine should companies without link to Khazanah has interest. Worse still, some personality with position within Khazanah has interest for the ungazetted land. Believe it was in mid 80s that DBKL, an entity under the PM Department gave away land cheap cheap ... to Tan Sri Vincent Tan. The land is believed to be the present Bukit Kiara Country & Equesterian Resort under Berjaya. Maybe Daim do not wish to see a repeat of the same incident. Lim Kit Siang wrote of it in his blog. Is there more than meets the eye in Daim's point 1? Khazanah boys are usually associated with one former trader who lost RM16 billion or some say RM30 billion. Images are taken from Apanama. He should have published the third concern and better, the whole article. Then it is clearer for other's to analyse. Rhetorics is not analysis. It is is hardly a conclusion and could be presumptous. in the end, it is not about what certain individual wanted to do or what the other person expected to have but it is rather about the stipulation within an accepted system. since the system have absolute decision on the eventual winner and since the winner takes all, a loser will do itself a favor by not opened the mouth lest it sounds more like a sore ones. Are you in the right posting? You refuse to grow up and talk intelligently or at least in some mature behaviour, forget about even attempting to comment again. You are wasting your time. 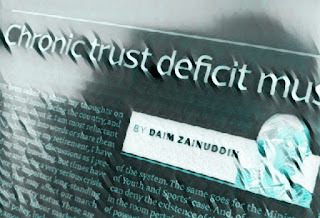 Daim accused PM of borrowing and spending to boost the economy. That is unfair, inaccurate and indenial comment by our former economic czar. Mahathirism economics is keynesian in ideology. It is interventionist. Public spending is seldom the tool to revive economy out of down cycle. Mahathir spend to grow the economy. He admitted recently he borrowed heavily upon being criticised for borrowing more than.the present government vis-a-vis GDP. He merely said its available so I took it. So it is the same with Najib. The major difference is his borrowing will not push bortowing to gdp beyond 100%. Najib's borrowing will expand growth geographically, activoty wise and across social.strata. 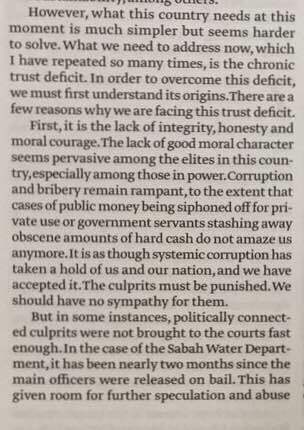 Mahathir made nation borrow to create projects, contract out yo cronies and later.privatised it, and failed to need government bailout! Enough blame on Mahathir. It was Daim that made it happen.